Kevin Porter and the No. 1 Michigan Wolverines will take on No. 4 Niagara in the East Regional. 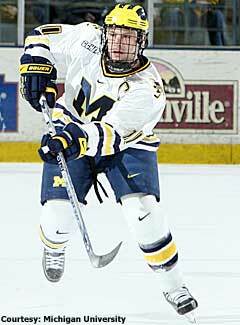 "Don't get overexcited and put too much pressure on yourself," said Ottawa's Mike Commodore about playing in the NCAA Tournament, where his North Dakota team appeared during all three of his college years from 1998-2000. "If you're gripping the stick and turning it into sawdust, before you know it you're down by a couple goals and your year is over. Relax, and play your game." Sixteen teams in four regional sites will bring their game to the tournament this weekend. The winner of each regional advances to the Frozen Four in Denver on April 10 for the semifinal games. The national championship game will be played Saturday, April 12. Here's the breakdown of regional matchups and how each got into the tournament; and an NHL.com comment about each regional outcome. East Regional -- March 28 and 29 in Albany, N.Y.
No team in this regional can remotely compare to Michigan's NCAA history. The Wolverines have a second-best 31 wins this season. Niagara has shown solid postseason play in its limited appearances. St. Cloud and Clarkson held on in the final weeks of the season for at-large bids. With heavy-duty scoring across the roster, led by Kevin Porter, solid defense, and junior goaltender Billy Sauer in his third postseason, it's tough to bet against Red Berenson's boys not getting to the Frozen Four. West Regional -- March 28 and 29 in Colorado Springs, Colo. This regional has the most balance across the four teams because it has the best complement of goaltenders in any regional. Last year, Michigan State came out of nowhere in postseason play with stellar goalie Jeff Lerg leading the Spartans all the way to a national championship. Colorado College freshman Richard Bachman and New Hampshire senior Kevin Regan were recently named Players of the Year in their respective conferences. Look for Lerg and a seasoned team of Spartan tourney returnees to end CC's season. Midwest Regional -- March 29 and 30 in Madison, Wisc. Goaltender Peter Mannino and No. 2 Denver University will face the No. 3 Wisconsin Badgers in a Midwest Regional matchup. No regional compares in skill level, including Cinderella Princeton with defenseman Mike Moore, forward Lee Jubinville, and goaltender Zane Kalemba. The young and talented Badgers got into the tournament by a whisker with the final at-large invitation. Three teams from the league with the most national titles means a WCHA team will compete for another in the upcoming Frozen Four -- unless Princeton pulls the two biggest upsets in NCAA history. 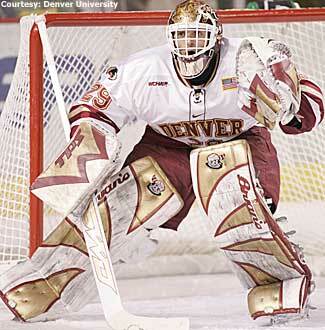 Denver has senior Peter Mannino in goal, the 2005 MVP of the Pioneers' national championship team. He's the razor-thin difference between Denver and the knee-deep-in-talent Fighting Sioux; these two provide the best regional final matchup. Northeast Regional -- March 29 and 30 in Worcester, Mass. The No. 2 Boston College Eagles will square off against the No. 3 University of Minnesota Golden Gophers in the Northwest Regional. There are no two hotter teams in postseason play than BC and Minnesota off the past two weekends of league-tournament play. There was no better team all season than Miami, with its NCAA-best 32 wins. Add that Air Force had Minnesota dead and buried in last year's regional with a 3-1 lead late in the game, before collapsing in a 4-3 loss. How about a coin flip before this final? 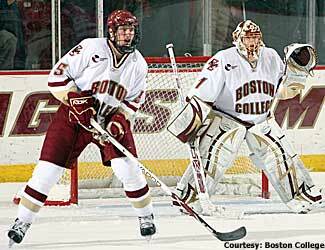 Heads, BC goes to the Frozen Four. Tails, it's Miami. BC has "home" ice with a high-octane offense and a freshman goaltender in John Muse who has played every game this season. Miami has a team of leaders, beginning with Ryan Jones and Nathan Davis. "Heads," you say? * Minnesota makes its NCAA-leading 32nd appearance. * Michigan makes its NCAA-leading 18th consecutive appearance. * Minnesota leads in all-time wins with 50. * North Dakota has the best tournament winning percentage at .695. * Boston University scored a best-ever 30 goals in 1990. * Bob McCusker (Colorado College - 1957), Shawn Heaphy (Michigan State - 1989) and Tony Amonte (BU - 1990), each lead in total goals with seven. * Tony Hrkac (North Dakota - 1987) and Shawn McEachern (BU - 1990) lead in assists with nine. * Aaron Broten (Minnesota - 1981) and Tony Amonte lead in total points with 13. * Chris Terreri (Providence - 1985) had 185 saves. * Ken Dryden (Cornell - 1967) leads in save percentage at .986. On Campus Clips -- League Players of the Year in each conference include: Princeton junior forward Lee Jubinville in the ECAC; New Hampshire senior goaltender Kevin Regan in Hockey East; Michigan senior forward Kevin Porter in the CCHA; Robert Morris University senior Ryan Cruthers in the CHA; Army's junior goaltender Josh Kassel in Atlantic Hockey; Colorado College freshman goaltender Richard Bachman was named both WCHA Player of the Year and WCHA Rookie of the Year, becoming only the second player in the 56-year history of the conference to earn both, and joining former University of Wisconsin and current NHL goaltender Curtis Joseph in that category (1989). … League Coach of the Year honors go to: Princeton's Guy Gadowsky in ECAC, Vermont's Kevin Sneddon in Hockey East, Michigan's Red Berenson in the CCHA, Bemidji State's Tom Serratore in the CHA, Army's Brian Riley in Atlantic Hockey, and Minnesota State's Troy Jutting in the WCHA. … The Hobey Baker Memorial Award Foundation named the top ten finalists for 2008: Nathan Gerbe, Boston College; Ryan Jones, Miami; Lee Jubinville, Princeton (Jubinville is the first top-10 finalist from the same school Hobey Baker played), Simon Lambert, RIT; Jean-Philippe Lamoureux, North Dakota; Ryan Lasch, St. Cloud State; Jeff Lerg, Michigan State; T.J. Oshie, North Dakota; Kevin Porter, Michigan; and Kevin Regan, New Hampshire. The final three will be announced the week before the Frozen Four. Look for the Hobey Hat Trick finalists to be Porter, Gerbe, and Jones -- with Porter named the '08 Hobey Baker recipient on April 11...The first-year ECAC Hockey "Pink at the Rink" program to benefit the American Cancer Society raised $40,000. Pink at the Rink was a newly created variation of a traditional Coaches vs. Cancer program to support the American Cancer Society's lifesaving cancer research, education, advocacy, and community service efforts.